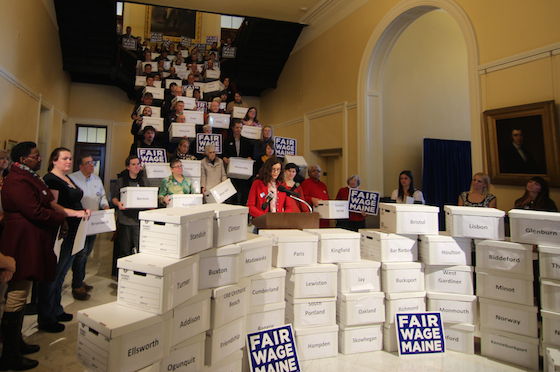 Today, Mainers for Fair Wages submitted 75,000 verified signatures to the Maine Secretary of State to place an increase in the minimum wage on the November ballot, far more than the 61,123 required. Supporters marked the event with a rally in the State House Hall of Flags and remarks from more than a dozen Mainers from across the state, many of them making low wages themselves, who helped to collect the signatures. Mainers for Fair Wages, a coalition including the Maine People's Alliance, Maine Small Business Coalition, and Maine AFL-CIO, launched the petition process for a citizen initiative to raise Maine's minimum wage in June. If passed, the initiative would increase the minimum wage to $9 per hour in 2017 and then by $1 a year until it reaches $12 by 2020. After that the wage would increase at the same rate as the cost of living. The initiative would also incrementally raise the sub-minimum tipped wage until it matches the minimum wage for all other workers by 2024. Raising the state minimum wage would directly affect more than 130,000 low-wage workers in Maine, most of them women and many of them supporting families, according to calculations by the Economic Policy Institute. According to Mainers for Fair Wages, the submission of signatures marks the end of the first phase of their people-powered campaign and the beginning of the next. The ballot question committee has already raised hundreds of thousands of dollars from supporters giving contributions average just over $30 each and the campaign will seek to increase and strengthen that broad base of support in the months between now and November. The office of the Secretary of State now has 30 days to review the petitions before referring the initiative to the legislature, which can choose to enact it without change or allow it to be placed on the November ballot.